The fascinating thing about this root bridge is, it’s a living root bridge , still growing and growing stronger with time. A rare thing! 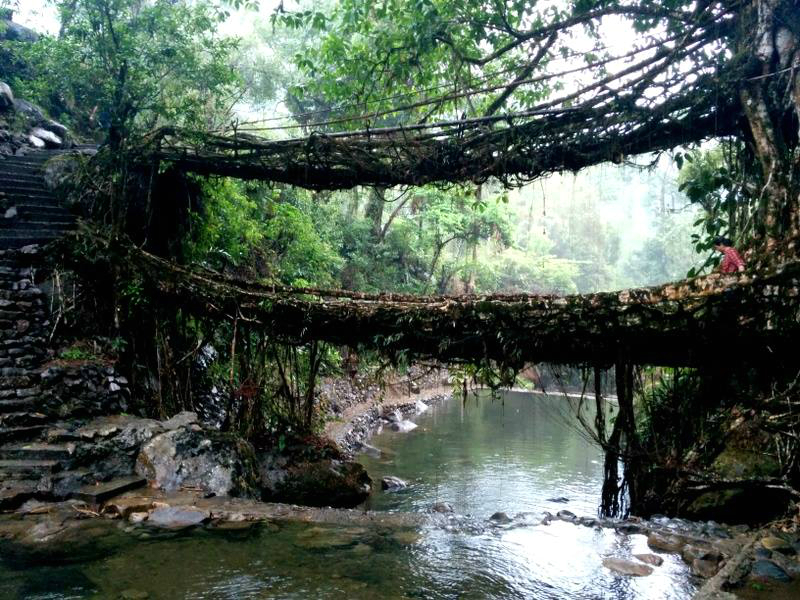 The bridge is the most phenomenal natural object I have ever seen in my life not because the living root bridge connects two banks of a river in a remote village hidden inside deep forests just like a concrete bridge but because it connects them twice. One bridge decked above the other! All natural and grown from a very very old (probably more than hundred years) banyan fig tree! The locals, still far-far away from the modern world, use the bridge for their daily commute. 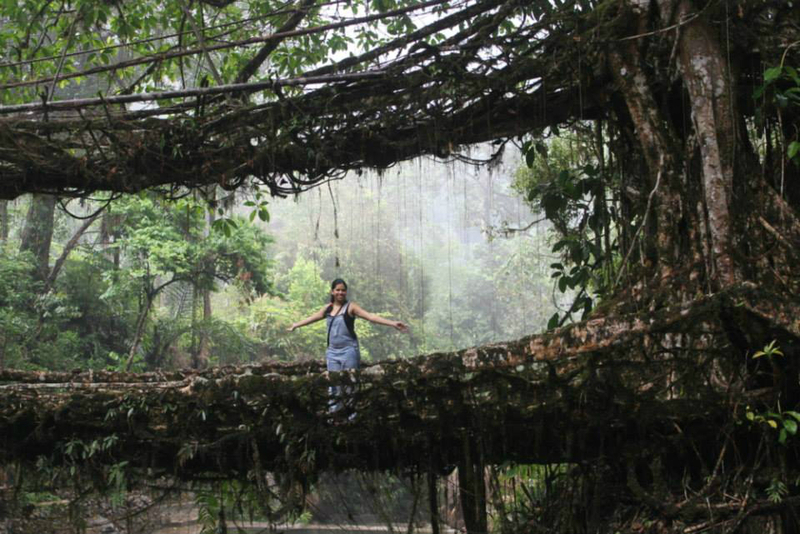 I had been hearing about the existence of two such living root bridges in Meghalaya for years and one fine spring (2014) I decided to go see them. The first bridge is located at Riwai in Mawlynnong, a village famous for its cleanliness. Reports have claimed this is the cleanest village in Asia. A short hike through the village and the bridge here is a magnificent web of old tree roots and beneath flows a gorgeous waterfall. But the main highlight of this trip was the second bridge. Because, it’s hidden and doesn’t show itself to anyone until he/she makes a trek of about three hours. So total six hours of excruciating trek! After about three hours of starting your journey, you come face to face with this thing of inexplicable marvel. I wouldn’t call it one of the toughest treks in the world but it was most definitely a tough one. The toughest part of all, the backward journey is a steep hike of about 2000 stony and slippery steps which are mostly non-existent. But the sight that awaits at the end of the trek is so rewarding one would want to do it again and again. At least, I would. While coming back, I finished last of all my friends because I had just recovered from a bad accident and doing a trek with soft tissue injury in my foot and without the knowledge of my parents was somewhat thrilling. The bones ached for a couple of days afterwards and the foot swelled like that of an elephant but this root bridge is definitely one of the things I would suggest people to go and see it for themselves. How to reach- the trek point is a few minutes from Cherrapunji, the rainiest place on planet earth. Tips- Make the hike in the early morning so that you can get back before the sun sets in the tropical forest. Because in this eastern-most part of the country and the deep jungles the sun sets as early as 4 pm. Also, wear good walking shoes.